1. Melt butter in large sauce pan. Add vanilla and marshmallows, stir until melted. Cook 3 min longer. Add Krispies, stir until coated. 2. Press mixture evenly into greased 13x9x2in pan, use a buttered metal spatula for easier use. 3. Cut into squares when cool, about 1 hour. 1. Melt butter in large microwave safe bowl, about 40 sec. Add marshmallows, microwave for 2 min, stir, then continue with 1 min intervals until marshmallows melt, stir in between. Add Krispies, stir until coated. 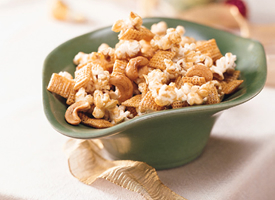 Indulge on this inexpensive, easy gluten free snack the whole family will enjoy. 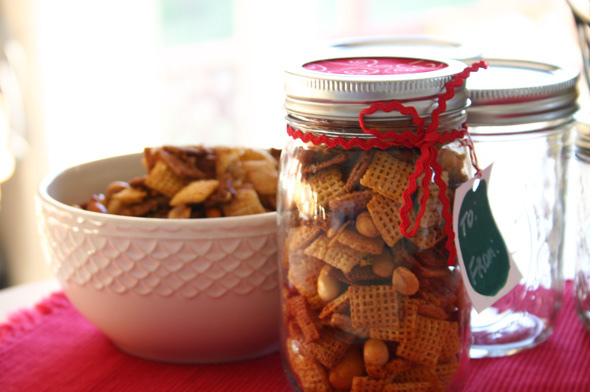 This tradition Chex mix recipe is always a crowd pleaser for all ages.